Description: This fixture was originally created by Meyda Co-Founder Meyer Cohen on the front porch of his summer studio in Old Forge in Upstate New York. 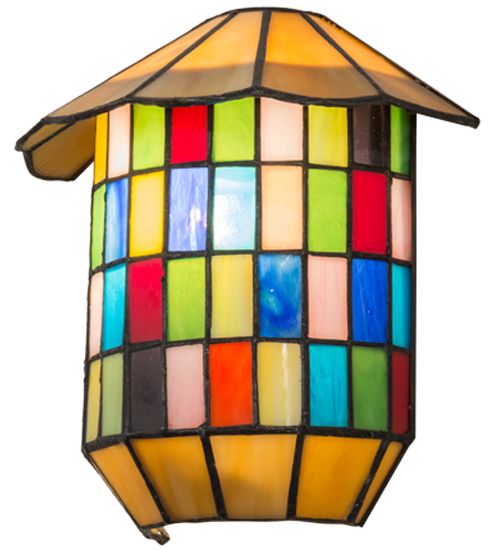 The Meyer Lantern was designed with a Honey art glass roof and bottom, with a cornucopia of Blues, Greens, Yellows and Reds, in various stained glass tiles throughout the center. This sconce can be seen adorning camps and vacation homes throughout the Adirondack Mountains. Options are available for both indoor and outdoor lighting applications, as well as custom sizes, colors, designs and dimmable energy efficient lamping options.